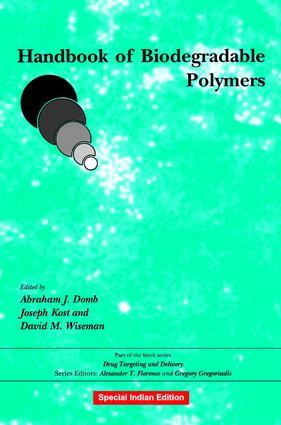 Handbook of Biodegradable Polymers, the seventh volume in the Drug Delivery and Targeting book series, provides a source manual for synthetic procedures, properties and applications of bioerodible polymers. The authors describe widely available materials such as polyactides, collagen and gelatin, as well as polymers of emerging importance, such as the genetically-engineered and elastin-based polymers which are either proprietary or in early stages of development. Section I addresses synthetic absorbable polymers, and Section 2 profiles natural, semi-synthetic and biosynthetic polymers. Section 3 discusses the surface characterization of degradable polymers, the modeling of biodegradation and non-medical polymers. This book is ideal for researchers from academia and industry as well as chemists, pharmacists and physicians who deal with biopolymers, drug delivery and targeting, bioengineering and implantable devices. Polyglycolide and Polylactide. Poly (p-dioxanone) and its Copolymers. Polycaprolactone. Polyhydroxyalkanoates. Poly (propylene fumarate). Poly (ortho esters). Other Polyesters. Polyanhydrides. Biodegradable Polyphosphazenes for Biomedical Applications. Poly (alklcyanoacrylates). Degradable Hydrogels. The Poloxamers: Their Chemistry and Medical Applications. Degradable Polymers Derived from the Amino Acid L-tyrosine. Natural Modified Polysaccharides. Oxidized Cellulose: Chemistry, Processing and Medical Applications. Gelatin. Collagen: Characterization, Processing and Medical Applications. Fibrinogen and Fibrin: Characterization, Processing and Medical Applications. Transductional Elastic and Plastic Protein-based Polymers as Potential Medical Devices. Genetically Engineered Protein Polymers. Surface Characterization of Bioerodible Polymers Using XPS, SIMS and AFM. Mechanisms of Polymer Degradation and Elimination. Non-medical Biodegradable Polymers: Environmentally Degradable Polymers.